18 Shake is a luxury meal replacement shake. You mix the 18 Shake powder with water, add optional fruits, and blend it into a smoothie. You then drink this smoothie instead of eating one of your regular meals. Replacing a meal with an 18 Shake smoothie is supposed to be an easy way to lose weight, but it’s not actually that simple. 18 Shake might actually lead to weight gain if not used properly. We have studied the ingredients used in 18 Shake to see how effective it actually is for weight loss. This review will give you all the information you need, plus some 18 Shake alternatives you may want to consider. Losing weight can be difficult. You should only spend your money on products that work. What’s In 18 Shake Powder? 18 Shake is mostly made up of whey protein, fiber, vitamins, minerals, some filler, and some flavoring. It’s a surprisingly simple set of ingredients, many of which are found in other nutritional shakes and protein powders. Here are the details of the 18 Shake ingredients. The main ingredient in 18 Shake is whey protein. Whey is a protein powder made from cow milk. It is the most common form of protein powder and is easily found in all health food stores. There are a lot of different types of protein, but for most people, whey protein makes the most sense. Whey is a fast acting complete protein. It’s got everything most people need in a protein powder, and is especially good after a workout. Whey is also cheap to produce, so it’s not difficult to find an affordable brand of whey. Whey concentrate and whey isolate: One interesting thing about 18 Shake’s whey protein is that it includes both whey concentrate and whey isolate. The difference between whey concentrate and whey isolate is how they are processed. Both are processed by extracting protein from cow milk. Concentrate is less processed, and therefore contains more carbohydrates, fats, and lactose. Whey isolate is processed in a more rigorous, more expensive manner, leading to 90% or more of the isolate being pure protein. Basically, concentrate is cheaper, and leads to 30-89% protein by weight, while whey isolate is more expensive and creates a more pure protein. It’s interesting that 18 Shake combines the two. A true luxury whey protein powder would likely consist only of whey isolate. The next ingredient in 18 Shake’s powder is digestion resistant maltodextrin (DRM). Maltodextrin is an extract created from corn or other starches. Regular maltodextrin (not DRM) is actually very popular in weight gain shakes as it is a cheap source of calories. DRM on the other hand is processed such a way that 90% of the result is dietary fiber. This will leave you feeling full without any calorie intake. Fiber is naturally found in fruits and vegetables and is not absorbed by the human boy. It does however play crucial roles in digestion. This is the ingredient that is responsible for 18 Shake’s weight loss claims. Drinking a bunch of fiber will make you feel full, without adding any calories to your diet. Instead the fiber will help regulate your bowl movements. Fiber can help with constipation and digestion irregularities. Most Americans do not eat enough fruits and vegetables in their diet and are lacking in fiber. DRM can help balance out these diets. A lot of the remainder of 18 Shake is specific vitamins and minerals. Vitamins and minerals are essential to a healthy body. 18 Shake can help you consume the vitamins and minerals you may be lacking. This includes Vitamins D3, B2, K, B1, E, B5. Finally 18 Shake includes a number of flavors and a few stabilizers. Flavors can include cocoa and stevia, but also “natural flavors”, which is a catchall for just about any sort of flavor you can find. 18 Shake also contains xanthan gum, which is a stabilizer found in many foods. Will 18 Shake Help With Weight Loss? One of the main selling points of 18 Shake is the ability to lose weight when using it as a meal substitute. Does this work? It can, but only if used correctly. Weight loss is all about calories. If your body burns more calories than you eat then you will lose weight. It’s that simple. If you have no idea how many calories you should be eating, try out our weight loss calculator. It will give you an idea of how many calories you should be eating every day to lose weight at a healthy level. 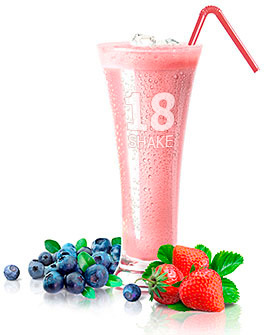 So, since weight loss is all about calories, how does 18 Shake help you lose weight? It’s all about the math. Lets say instead of eating a sandwich (400 calories) for lunch you drink a scope of 18 Shake powder (90 calories) blended with some water (0 calories) and a cup strawberries (46 calories). Instead of consuming 400 calories, you just consumed 136 calories. That’s 264 calories less than you would have. If you don’t change anything else about your activity levels, and don’t eat more than you used to during your other meals, you will have a caloric deficit of 264 calories that day. If you have a 264 calorie deficit every day you will lose about a pound of fat in two weeks. That’s pretty good. A pound of weight loss every two weeks is a healthy rate at which to lose weight. And because 18 Shake is packed with Digestion Resistant Maltodextrin, you won’t feel very hungry, even though you ate less calories than normal. This sounds pretty good. And you will lose weight even faster if you replace a meal that has more calories than a single sandwich. The fact that the first ingredient in 18 Shake is protein powder means that if you combine 18 Shake with a workout routine, you will transform fat into muscle. Exercise is great for your health and the way you look. A good looking body is not about having zero body fat. It is also about having a healthy amount of muscle. Working out when using 18 Shake will be more effective at shedding fat and gaining muscle. So yes, 18 Shake can definitely help you lose weight. Though all the above is true, there may be some people who are unable to lose weight using 18 Shake, or might even gain weight while drinking 18 Shake! There is no magic pill that can defy physics. The physics of weight loss says that you will lose weight if you consume less calories than you burn. You will not lose weight using 18 Shake if you do not consume less calories than you did before. To use 18 Shake correctly, here are some things you must remember. 18 Shake is supposed to substitute some of your meals. The idea is that a smoothie or shake made with 18 Shake will have less calories than the meals it is replacing. The meal that is being replaced must have more calories than the 18 Shake smoothie. The more calories you are replacing, the faster you will lose weight. Do not use 18 Shake as a snack. To lose weight, use it as a meal replacement. You may feel hungry if you replace one of your existing meals with an 18 Shake smoothie. This is natural. Your body is used to getting a certain amount of calories, and if you are on a diet, you are providing your body with less calories than it is used to. You may feel hunger. Do not respond to this hunger by eating more during your other meals. Also, do not respond to the hunger by adding more snacks into your day. If your 18 Shake meal replacement saved you 250 calories, but then you eat an additional 300 calories during your next meal, because you are extra hungry, you will gain weight. This is the biggest danger with meal replacements. A lot of people replace one meal, but then end up eating more during their next meal. You cannot lose weight if you do not control the total amount of calories you consume in the whole day. As readers of SmoothieGains.com know, it is possible to create a very high calorie smoothie. There are plenty of smoothie recipes that are over 1000 calories. You must make sure that the smoothie you are making has less calories than the meal it is replacing. That’s a great looking smoothie recipe. However, there are more calories in that smoothie than a normal 400 calorie sandwich. So unless the sandwich you are replacing is massive, you are not going to lose any weight drinking the above smoothie instead. Is 18 Shake Worth It? 18 Shake does a good job of combining common supplement ingredients into a single powder. You get quality protein powder, dietary fiber, vitamins, minerals and a good tasting product. The dietary fiber makes this a great product for someone looking to lose weight. Most protein powders do not include vitamins and minerals. And most vitamin and mineral supplements do not include protein powder or dietary fiber. By combining all of these into a single powder, with proper proportions, 18 Shake is very convenient. If you need to save money, you can probably buy all these ingredients on their own and create your own smoothie powder. But if you don’t have the time for that, 18 Shake is a nice alternative. Though 18 Shake is a convenient mix of supplements that can be used to lose weight, it might not be exactly what you are looking for. It is not a cheap product, though you often get what you paid for. If you don’t think 18 Shake is exactly what you are looking for, check out these alternatives. Making your own weight loss powder is not difficult, it just requires some work and buying a lot of separate ingredients. The best thing about creating your own weight loss powder is that you can decide exactly what goes into the powder and what the ratios are. Maybe you don’t need as much protein powder as 18 Shake has? Or maybe you already take a vitamin and mineral supplement and don’t need the vitamins that 18 Shake has? When you make your own shake, you are putting in only the things that you want. The biggest drawback of making your own weight lose powder is all the work you have to put in. Instead of buying a single powder, you have to buy all the ingredients separately, and then mix them all together. 310 Shake is a product that is very similar to 18 Shake. It has a very similar nutritional make up. Lots of protein, lots of fiber, few calories. They both have 90 calories per serving. The price of each is also similar. One big difference is the taste of these products. 310 Shake has more flavors than 18 Shake, but none of them taste as good. 18 Shake uses real cocoa in their chocolate flavored shake and stevia as a sweeter. The difference in taste is noticeable, with 18 Shake being the clear winner. 310 Shake has a good amount of vitamins and minerals, but they put most of their emphasis on their protein powder. They use whey protein along with a few different types of plant proteins, such as pea protein. This provides a well rounded source of protein powder in the mix. Between the two, I like the taste of 18 Shake more, so that is what I would buy. However, if you ever see a great deal on 310 Shake, it might be worth it to switch to that. Their nutritional make up is very similar. Shakeology is one of the most popular weight loss, meal replacement mixes. It is created by the same people who created the P-90X and Insanity workout programs. Originally it was meant to go hand in hand with these fitness programs, but today Shakeology is used by anyone looking to get into better shape. The biggest difference between the two is that Shakeology is designed for active individuals. People who are going to the gym, doing P-90X, Insanity, or other high intensity workouts. If you are highly active, Shakeology may be a better product than 18 Shake. Shakeology has a larger scoop, which means a larger serving size. This is because it is meant to assist people who are active and who are burning through more calories each day. Shakeology also has a lot more ingredients. It has tiny bits of things like blue green algae, spinach powder, and flax seed meal. These are added because they are believed to be healthy foods. By weight, 18 Shake is a superior powder. It has more protein, more fiber, less sugar, and less carbohydrates than Shakeology. Because of all this, I would recommend 18 Shake to anyone who is not actively doing a high intensity fitness program such as P-90X. If you are very active, you may get more out of using Shakeology. Protein shake: Water or milk or something else?